Rose Wedding Invitation, Vintage Wedding, Rocker Wedding, Printable Wedding Save the Date Card, DIY Printable Wedding Set, Rose Tattoo. 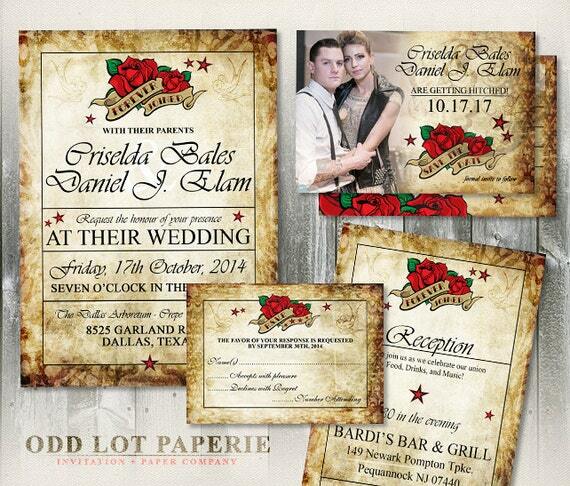 Super one of a kind and makes a statement, this rose wedding invitation is great for those rocker weddings with a vintage or distressed feel. You'll receive a high quality pdf or jpg (you specify) with your customized invitation. Print and cut, you are done! Print only what you need, how awesome is that? Or you can take the files to your local printer and have them printed there! *Customization of colors and sizes can be done on request! // Place your order by adding to your Etsy cart. // Once payment and card details are received, within 48 hrs, I will send you a low resolution watermarked proof for final approval. Minor edits such as spelling/typos can be corrected at this point for no additional charge. // Once your design looks great, I will email you your final invitation files in print ready PDF or jpg format. Print these designs at home, or take them to a professional printer- the design fee remains the same no matter how many you need to print.! Typical turnaround time is 1-2 weeks. ***Please note that this is for a digital copy of the design only, and does not include paper or printing. **** This is DoubleAction Design (Julie Farrell) original design and for your personal(non commercial) use only.